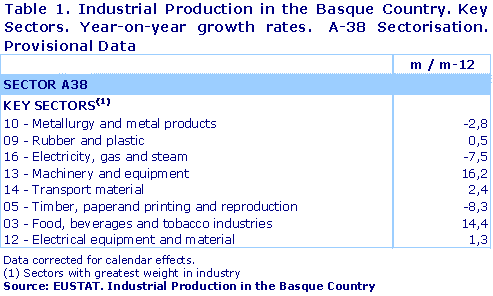 Compared to the previous month, December 2011, the industrial production of the Basque Country fell by 0.5%. Industrial production of the Basque Country in January 2012 fell by 1.8% compared to the same month in 2011, in homogenous terms of the working calendar, according to Eustat data. 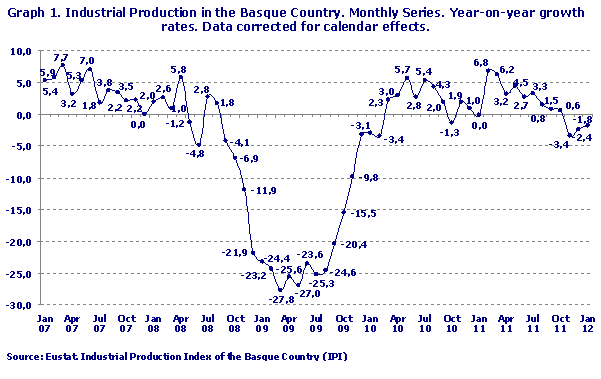 Compared to the previous month, December 2011, the industrial production of the Basque Country fell by 0.5%, once seasonal effects had been corrected. By sector, and using the classification of the major industrial sectors, the evolution of the index for January 2012 compared to January 2011 shows noticeable differences. Equipment Goods rose by 5.1%, Intermediate Goods fell 2.9% and production of Consumer Goods as a whole rose by 4.7%, due to the rise experienced by Consumer Non-Durables, which rose by 9.5%, whilst Consumer Durables fell by 9.4%. Energy fell by 18.2%. The month-on-month variation in January 2012, compared to December 2011, also registered distinct changes for the main industrial groups. Intermediate Goods rose by 1.0%, Equipment Goods rose by 0.7% whilst Energy posted a drop of 3.1%. Consumer Goods as a whole fell by 3.1%, with Consumer Durables and Consumer Non-Durables posting drops of 7.0% and 2.1%, respectively. The key sectors that posted the greatest increases in growth in January 2012 compared to the same month of the previous year were Machinery & equipment and Food, Beverages & Tobacco with rates of 16.2% and 14.4%, respectively, along with Electrical Equipment & Material, which rose by 2.4%. On the other hand, the Timber, Paper & Graphic Arts sector registered a year-on-year drop of 8.3%, Electricity, Gas & Steam fell by 7.5% and Metallurgy & Metal Products posted a fall of 2.8%. By province, year-on-year performance of the Industrial Production Index for the month of January showed positive results in Álava, where it grew by 3.0%, and in Gipuzkoa, with an increase was 0.4%, whereas Bizkaia witnessed a fall of 6.3%. The month-on-month growth rate was negative in both Álava, where it fell by 2.4%, and Bizkaia, which experienced a drop of 0.4%, whereas in Gipuzkoa it rose by 0.4%, compared to December 2011.